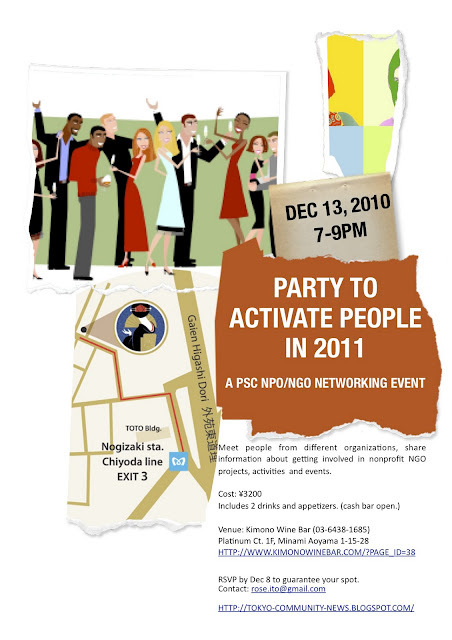 Enjoy some time with us on Dec 13! Daw Aung San Suu Kyi is released from house arrest! Daw Aung San Suu Kyi, a Nobel Peace laureate who was confined 15 of the last 21 years, was freed from house arrest. What is next for Burma and the Burmese people? 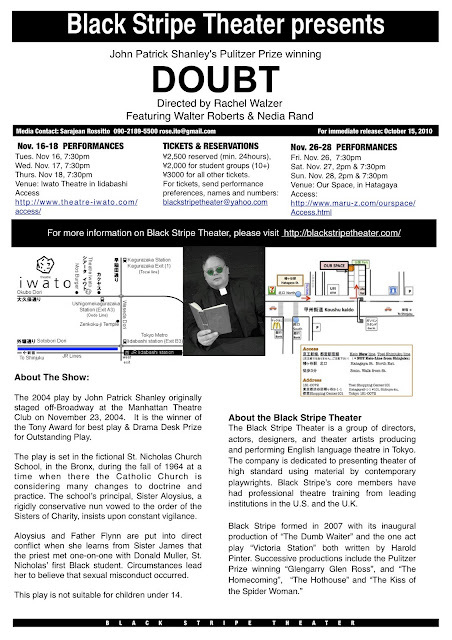 Black Stripe Theater presents John Patrick Shanley's Pulitzer Prize winning DOUBT. Come see Black Stripe Theater's production of Doubt! DOUBT production coming to Tokyo! The nearest station is Ushigome-kagurazaka (Exit A3) on the Oedo Line. Other close stations are Kagurazaka (Exit 1) and JR Iidabashi (West Exit). As part of the IE3 Global internship program - i made a number of visits to nonprofits this week with Eric the Regional Director for Asia. NOTE: The IE3 program is only open to students enrolled at select partner universities in the Western United States. If your university is not included on the list of participating schools, you are not eligible to participate. RIJ is very busy getting ready for Journey to Hope, an interactive refugee experience using shipping containers in Tokyo, Yokohama and Kansai. Students will live out the "refugee experience" and children and adults alike will have the opportunity to learn about refugees through the exhibits, displays, activities and entertainment. It was a lot of fun - even for just 90 minutes! I got to see so many NGO friends and meet a lot of new people ... forgot to take pix again. "For decades, Japan was described as an “all-middle-class society,” a characterization that was always open to skeptical analysis. How do you feel about the outcomes of the UN Summit and the review of the MDGs? there sure have been a lot of sample Success Stories that have come out in their publications but so much still needs to be done! The original goal of .54 will not be enough to achieve the MDGs => we need to be active citizens and tell our leaders to follow through on promises. In the words of the people from Action Aid - the hungry can not eat promises. Poverty.com has some sample letters you can use to send to your government's leaders. "Print out a simple letter to your government supporting 0.7% in international aid. If enough people in enough countries mail enough letters, this great objective can be achieved." 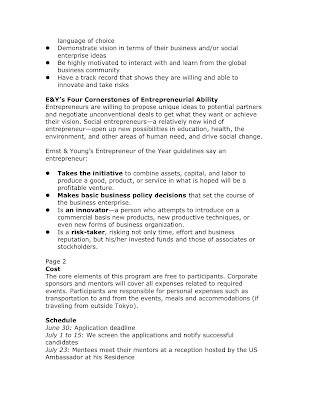 Have some research to share about nonprofit in Japan? 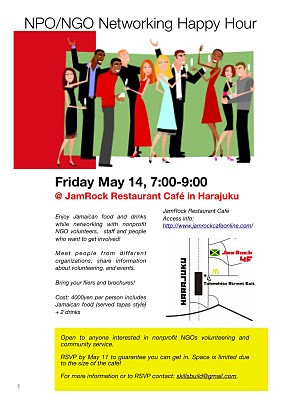 A lot of people would like to know about your research about the developments in the Japanese nonprofit NGO sector! 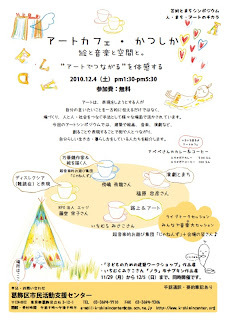 The NPO gakkai is accepting papers for presentation about nonprofits in English for the next conference to be held in 2011 in Miyazaki.the deadline is only 2 weeks away - Oct 3 - get more info as well as the template and application form below. "The Human Development Reports produced since 1990 by the United Nations Development Programme are widely considered the most influential of the many regular reports by multilateral institutions. Unique among UN publications for their tradition of intellectual independence – though sponsored by UNDP, they do not represent its official views or policies – the Human Development Reports are best known for their innovative and often controversial analyses of critical issues, and for the annual Human Development Index, which was created as an alternative to income-based measures of national and individual well-being." Q#1 Do you know how many registered NPOs there are and how many exist that are not officially registered? 42170 as of June 30 or July 31 this year depending on which site you look at! Q#2 # of unofficial or unregistered groups ??? not sure i have seen numbers like 80,000 and 200,000 but not really sure which is more accurate. Q#3 are here stats on ave size and funding? 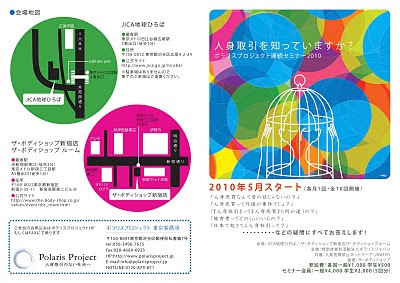 The japan npo center and japan foundation center used to have this data online but i can not find it right now please let me know if you find such data anywhere! Average annual income per organization: 2 million yen. Fall 2010 TUJ workshop series - NGO mgt. July 16, 2010 (TOKYO) – The founder of Indian NPO, the Association of Relief Volunteers (ARV), and visionary human rights activist T. Ravi Kumar will speak in Japan for the first time this summer, in an effort to expand ARV’s message further than ever before on the international stage. Speaking seminars will be held on July 31st in Osaka and August 1st in Tokyo. 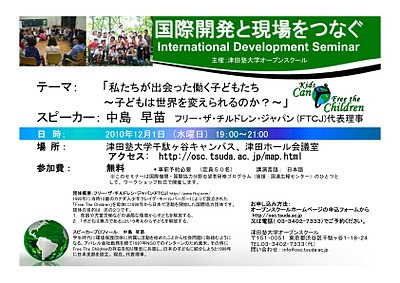 The Osaka seminar will take place at Nishi-machi Koutou Kaikan (next to Shin Osaka Station, west exit) at 7-10-14 Nishi Nakashima, Yodogawa-ku, Osaka-shi. The Tokyo seminar will be held at Star Lecture Rooms on the third floor of Kawagami Building at 2-22-17 Minami-Aoyama, Minato-ku, Tokyo. Seminars in both locations will be held in Japanese from 14:00 to 15:15 and in English from15:30 to 16:45.
" /> Equality Now has just issued an urgent alert - Mexico: Take action against the officials who raided a high security women's shelter in Ciudad Juárez, Chihuahua State. Please write to the Head of the Chihuahua State Supreme Court and the Governor of Chihuahua and ask them to take disciplinary action and prosecute the officials involved in the raid on the shelter for violating Mexico's General Law on Women's Access to a Life Free of Violence. We hope that you will support this and our other Women's Action campaigns. Admission is free and advance registration is not required. In a landmark decision involving foreign vocational trainees, the Labor Standards Inspection Office in Kajima, Ibaraki Prefecture, has recognized the June 2008 death of a Chinese man working at a metal processing company as a case of karoshi, or death from overwork. The labor inspection office sent papers to prosecutors on Friday accusing the company and its 66-year-old operator of violating the Labor Standards Law by imposing excessively long work hours and failing to pay overtime. According to the office, Jiang Xiaodong, 31, died of acute heart failure while asleep in June 2008, three years after coming to Japan as a trainee. In the three months prior to his death, Jiang worked between 93 to 109 hours in overtime each month, the office said. 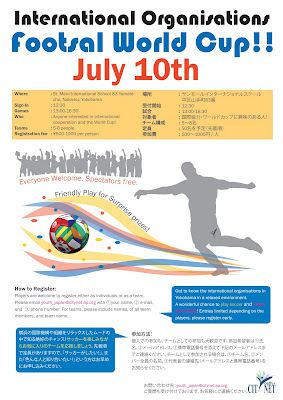 CITYNET Youth Japan's International Organisations World Cup taking place on July 10 in Yokohama. event so absolutely no worries about skill level! Please see flier for details. Open to nonprofit NGO volunteers and staff and anyone who wants to get involved in community service. Contact skillsbuild@gmail.com for more information.